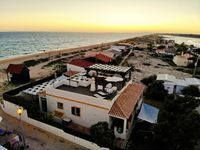 Properties in Faro average 4.6 out of 5 stars. Property 22: wonderful villa with beautiful view of the mountains special price May , June. Property 25: Downtown Home is a beautiful apartment very well located. Faro central apartment completely refurbished, Wi-Fi available and TV. Property 31: Faro central apartment completely refurbished, Wi-Fi available and TV. Property 42: Ilha culatra, voted best beach on the Algarve. Traditional fishing island. Rent charming villa Algarve 5 minutes from the beautiful village of Estoi. Property 44: Rent charming villa Algarve 5 minutes from the beautiful village of Estoi. Like the title, everything was perfect. The very clean apartment is on the third floor of a very well located building with a large balcony at the front and a smaller one on the side where there is a clothesline. 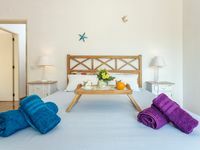 The beds and pillows are comfortable, the kitchen is well equipped, the bathroom with a large shower and the living room. The friendly and welcoming owner gave us explanations and recommendations on the city and he even helped us with our suitcases. If we had to return to Faro we would book in the same place. Thank you Ivan. We had a lovely time walking the beach at Praia de Faro &mdash; Hiking in the Parque Natural da Ria Formosa &mdash; Sunsets atop our villa &mdash; Coffee and snacks at Ze-Zea. The time went too quickly and we would love to return.